Take It One Step Further—Bring on the Real Data! Discuss iterations and limitations with stakeholders. Add Salesforce data to your prototype. Understand the importance of iteration in prototyping. Before we get too far along, let’s check back in with our stakeholders and make sure we’re on the right track with this prototype. By checking back with the designers and researchers often, we can ensure everyone is up to date on the latest progress and expectations. This can also be a time to catch design flaws early. As prototypers, we’re the first users and testers, so we can make suggestions to the designers whenever something doesn’t feel quite right. Stakeholders can also be product managers (PMs) who have more knowledge about the technological feasibility of certain features. Having PMs involved can help ensure the prototype is realistic and manageable. So your stakeholders had a lot of feedback on the prototype? Don’t worry...that’s expected. The key to prototyping is iteration. As Bryony Wilson from Empathy says, “Prototyping is like love. You don’t want to settle for the first one that comes along.” We rarely get everything right on the first try, because we, as designers and UXEs, are not our users. So we are bound to find usability gaps once we introduce the features to fresh eyes. In this scenario, the stakeholders are concerned the type of each card isn’t clear because every card looks the same and they are not easily scannable. Let’s iterate on that design before our research sessions to determine if we’re closer to the best possible solution. In Developer Console, select File › Open Lightning Resources. Click c:ResultsSection to expand that section, click COMPONENT, and then click Open Selected. Add the following code to the lightning:card tag: iconName="standard:account". Unfortunately, we have to repeat this for all of the Account cards. Maybe later we can make our prototype more scalable so we don’t have to go through this hassle. Back in your org, refresh your Search Results page and bask in the glory of your beautiful new icons. But that just isn’t enough...let’s add in some real data to help bring our prototype to life. There can be risks with this, such as stakeholders thinking the feature or product is much more “done” than it actually is. So be sure to make it clear to your stakeholders that this is still a prototype. Instead of having our dummy Account, Contact, and Lead data on the cards, let’s query the database for actual records. 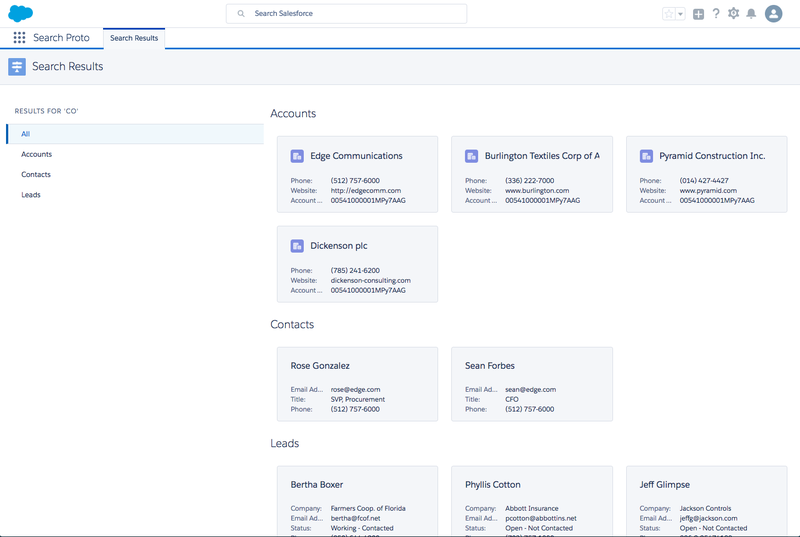 First we create simple Apex classes that return a list of accounts, contacts, and leads. In your Trailhead Playground, click the setup gear icon and choose Developer Console. Click File › New › Apex Class. Still in Developer Console, select File › Open Lightning Resources. Next, insert a new line after Line 1 in order to declare our variables and initialization function. Click the Helper option on the right panel. Click the Controller option on the right panel. Next, we bring it all together by using the aura:iteration tags to iterate over our real data and display it in the UI, thus making our prototype scalable for future changes. Click the Component option on the right panel. Ready to see the magic? Go back in your org, refresh your Search Results page. You should see some real data lighting up your prototype. Now that we have a more realistic, scalable prototype using real data, it’s time to do some user testing with our researchers.